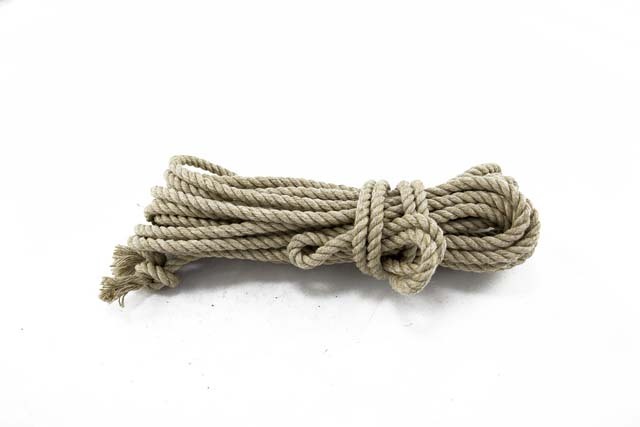 Top quality 3-ply twisted, industrial strength linen hemp ropes supplied in 8m (26ft approx.) and 10m (33ft approx.) lengths finished with a simple knot. Amanawa ™ linen hemp rope is perfect for those who want a durable, ready to use rope that requires no special treatment. It has fineness of cotton, yet the benefits of a traditional hemp with none of the drawbacks. The 6mm has around 80 ultra-fine treads per ply, unlike standard hemp with single figures of coarse yarns. This means an amazingly fine rope with unparalleled consistency, not the usual rough product. Those who like the 'heft' of hemp will appreciate its weight as this is a very dense rope. Although, fans of the rank farmyard smell of traditional hemp might be disappointed, others will relish its fresher odour. This is undoubtedly one of my best selling ropes. If you're a hemp fan, you'll quickly see why! Counterfeit warning: Amanawa ™ is a long-standing trademark of Esinem and ESINEM-Rope. Please be aware that a German-based supplier is passing off another product under this brand name.